The 2018 racing season got underway this past weekend in Daytona, and while the feature 24-hr race didn’t have any Pfaff branded cars competing, the 4hr Continental Tire Sports Car Challenge featured 5-cars sporting some Pfaff branding. The Pfaff Audi RS3 LMS fielded by Compass Racing qualified on class-pole for the TCR category, and managed a strong 2nd place finish at the end of the 4hr race! The race was won by it’s sister car, also fielded by Compass Racing which contained some more minor Pfaff branding, so a great day nonetheless for the Audi’s! There were also 2 McLaren 570S GT4 cars sporting Pfaff branding as well, but the high banks of Daytona didn’t suit the nimble supercar. Unfortunately, both cars came home outside the top-10, but many thanks goes out to McLaren Toronto‘s shop foreman Terence Mcgrath who was there in support for both cars, and was put to work sorting out some engine issues that plagued the cars at the start of the week. 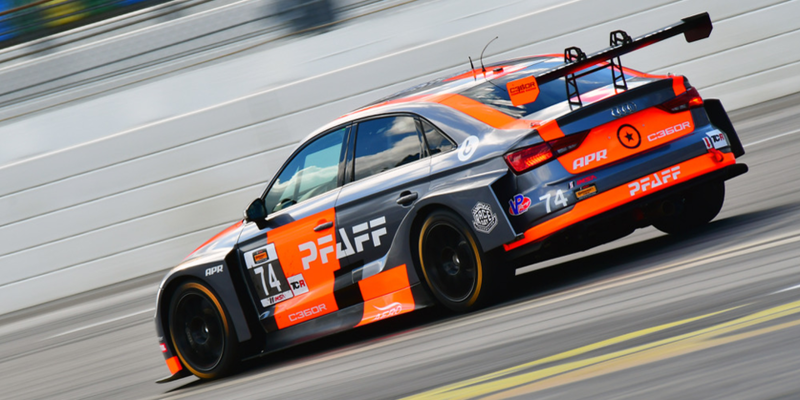 As for the Pfaff Motorsports team, their season gets started in 6-weeks down in St. Petersburg, Florida as they kick-off their debut season in the highly-competitive Pirelli World Challenge! Pfaff Motorsports be competing with Scott Hargrove in a Porsche GT3R for the sprint races, and for the longer SprintX events, Scott will be joined by former Porsche Factory Driver Wolf Henzler to bring the attack to the manufacturer teams we will be competing against! By submitting your email address or phone number, you allow us, Pfaff Auto, to include you on our contact lists to send you information about our products, services and promotions. You may revoke consent at any time by clicking on the "Unsubscribe" link in your email.